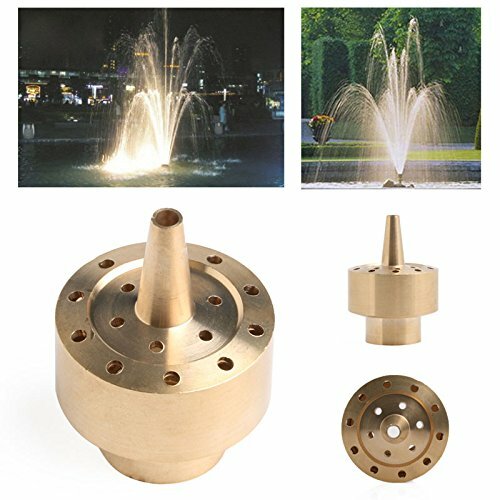 Techinal 3/4" DN20 Brass Column Fireworks Fountain Nozzle Sprinkler Spray Garden | Fountain City Art Ctr. This nozzle is a kind of porous scattering nozzle. It is also called column nozzle, orchid or flower layered nozzle . Fountain nozzle sprays create beautiful visual effects for ponds and water gardens of all sizes. EASY INSTALLATION, it only requires pvc tubing and a submergible water pump. The performance of all fountain spray heads is directly affected by the gph pumped through the fountain nozzle head. For a higher and wider spray pattern in your pond, a higher gph pump is required. Other outside size,which as shown in picture. It is also called column nozzle, orchid or flower layered nozzle. If you have any questions about this product by Techinal, contact us by completing and submitting the form below. If you are looking for a specif part number, please include it with your message.